Anton Paar provides measuring instruments for laboratory at the Technical University of Graz. The handover of a total of 10 Anton Paar measuring instruments was celebrated on Monday, September 19, 2017, at the Technical University of Graz (TU Graz), Faculty of Technical Chemistry, Process Engineering, and Biotechnology. 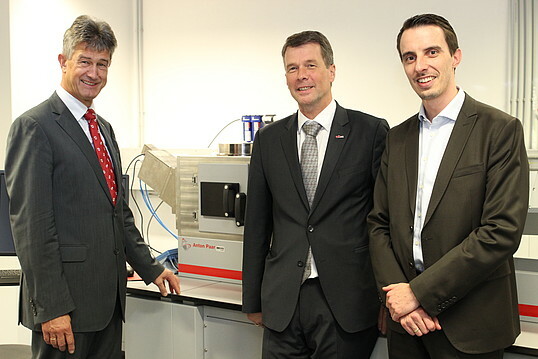 The measuring instruments worth about 600,000 Euro will be in use at the TU Graz “Soft Matter Application Lab”. In this laboratory scientists research soft materials. It can be used by all Styrian universities and the University of Maribor. First cooperations have been arranged with the Montanuniversität Leoben (University for Mining, Metallurgy, and Materials) and the University of Graz. The laboratory serves especially for measurements for master theses, dissertations, and research projects. It is unique in Austria as so many different measuring instruments are available in one room, ranging from the more than 2.5 meter long Anton Paar laboratory system SAXSpoint to the much more compact density meter. Among others, TU Graz rector Harald Kainz, TU Graz vice-rector of research Horst Bischof, dean of the Faculty of Technical Chemistry, Process Engineering, and Biotechnology Frank Uhlig, Anton Paar GmbH’s Jakob Santner and chief scientist Gerhard Murer were present at the handover of the measuring instruments.